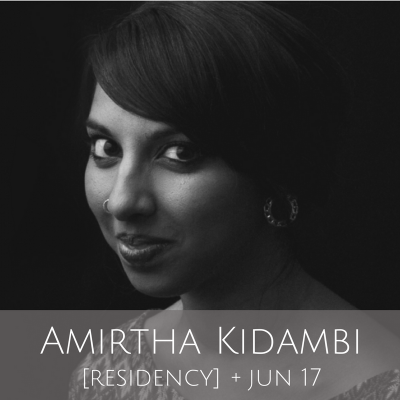 What: Two-part performance-as-purge from established experimental vocalist and bandleader, Amirtha Kidambi. Brooklyn, NY — For her first residency performance of the 2017-2018 season, Amirtha Kidambi performs Yajna, a solo vocal ritual designed as a sacrifice to the metaphoric sacred fire to purge the dark energies of this era. The performance will be followed by Kidambi’s quartet Elder Ones. Amirtha Kidambi is invested in the performance and creation of music, from free improvisation and jazz, to experimental bands, and new music. She is a soloist, collaborator, and ensemble member in groups including Charlie Looker’s early music inspired dark folk band Seaven Teares, Mary Halvorson’s quintet Code Girl, analog percussion and light ensemble Ashcan Orchestra, and Darius Jones’ vocal quartet Elizabeth-Caroline Unit. As an improviser, she has played with Matana Roberts, Tyshawn Sorey, Ingrid Laubrock, Daniel Carter, Ava Mendoza, William Parker, Trevor Dunn, and many innovators in the New York scene. Recent collaborations include the premiere of AACM founder and composer/pianist Muhal Richard Abrams’ Dialogue Social, Darius Jones’ The Oversoul Manual at Carnegie Hall, a premiere of electronic composer Ben Vida’s work Slipping Control for voice and electronics with Tyondai Braxton at the Borderline Festival in Athens, Greece, the premiere of the late Robert Ashley’s final opera CRASH at the Whitney Biennial, a Jazz Gallery commission for Mary Halvorson’s Code Girl, the premiere of William Parker’s Soul of Light and a commission from the Jerome Foundation for her quartet Elder Ones at Roulette and artist residency at EMPAC to record the group’s debut album. Elder Ones is the quartet performing the compositions of vocalist Amirtha Kidambi. Situated in concentric musical circles and communities in New York City, her collaborators include saxophonist Matt Nelson (Battle Trance/GRID), bassist Nick Dunston (Tyshawn Sorey Trio) and drummer Max Jaffe (JOBS/Peter Evans’ Being and Becoming) have crossed paths in the DIY underground and permutations of free improvisers in clubs and concert halls across New York City. The instrumentalists chosen for this project draw from a wide variety of vocabularies from hip-hop to the avant-garde, each bringing their highly individual language to the group. The quartet uses composed material and loose structures for improvisation, over a bed of Indian harmonium drones and synthesizer. Oscillating between worlds of raga, microtonality, jagged rhythmic precision and punishing brutality, Thyagaraja, Alice Coltrane or Stockhausen could be equally suspect sources of their sound.